What better way to celebrate the love that you have with the person you want to be with for the rest of your life than hosting the event of the year at the peak of one of the most beautiful places on earth. The peak of Whistler Mountain Resort is stunning. If you catch it on a clear day you can see the peak of Blackcomb and Black Tusk off in the distance is a stunning view and a perfect place for photos. 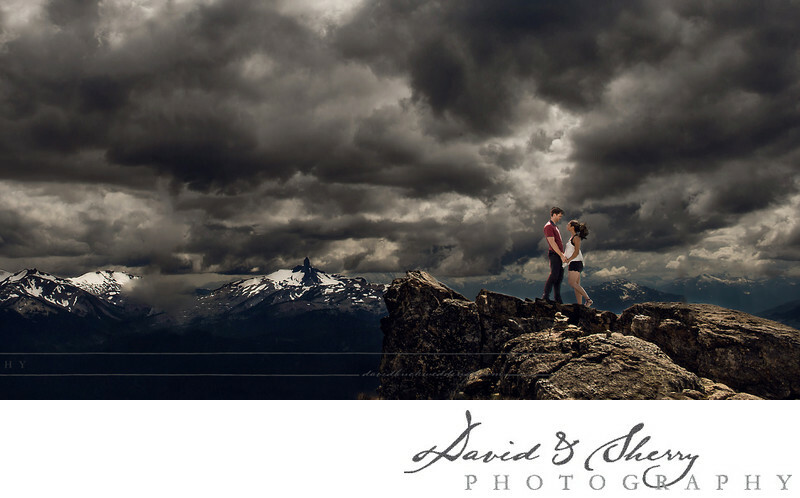 As your Whistler wedding photographer David & Sherry will capture stunning views and incorporate the beauty of your dress, posing and flowers with beautiful expressions showcasing your Couplescape at the top of the world. The round house provides a fantastic relaxation place once you're done and heading down the hill. Once you get back to the village, you have the choice of hosting your reception at some of the best all in one hotel venues Canada has to offer. The Fairmont Chateau Whistler is the best option for luxury weddings, with the ability to host large amounts of wedding guests and as the Fairmont brand always does in luxury style. We love photographing weddings here as the fabulous decor, chandeliers and intricate details of the beautifully designed resort adds wonderful feel for the finished images of the bride, groom, groomsmen and bridesmaids. The Whistler Golf Club provides a beautiful golf course feel with mountainous backdrops, the Nita Lake Lodge is away from civilization and gives you that natural atmosphere for your guests, the Mountainside Lodge, Four Seasons Resort, Sundial Boutique Hotel, Coast Whistler Hotel, Westin Resort and Whistler Blackcomb Ski Resort are all excellent Whistler wedding venues. There are many different locations to take pictures throughout the village, the mountain and the surrounding parks and venues will provide picture perfect images for your wedding and we would be happy to be your Whister Wedding Photographers. David & Sherry will capture everything from the early morning hair and makeup to the getting ready and the putting on of the dress, the details of your flowers, bouquet, garter, bridesmaids dresses and boutonnieres, to the walking down the aisle, first kiss, formals and first dance as well as the cake cutting, bouquet toss and the end of the evening. Let us be your Whistler Wedding Photographers and capture great moments of you, your family and your invited guests.